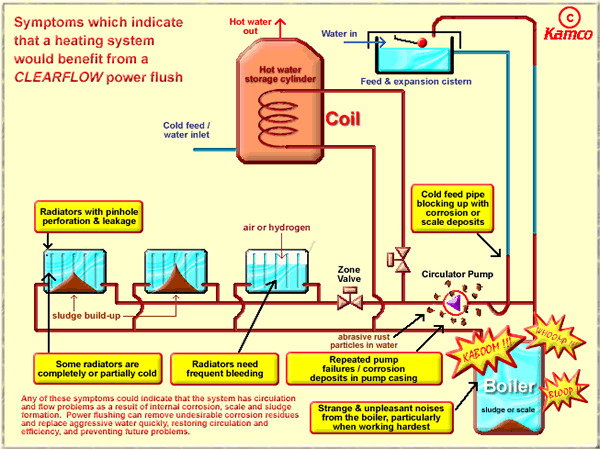 Powerflushing is the most efficient and effective method of cleansing a central heating system. The principle is to circulate a cleansing chemical under controlled conditions to remove debris from the system. A Powerflushing pump is attached to the system and under pressure pumps the cleanser throughout the central heating pipe work and radiators. 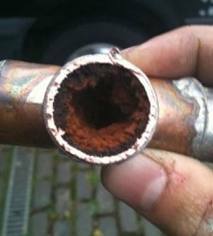 The outcome is a central heating system that is clear of debris including Limescale and Iron oxide sludge. -Heating system slow to warm up. -Cold spots at the bottom/middle of radiators. -Radiator water is black with sludge. -Frequently purging air from radiators. -Radiators having rust spots or pin holes at the bottom. -Cures flow and circulation problems. -Restores heat output to radiators. -Cleans the whole central heating system including underfloor pipe work. -Removes toxic water and in turn prevents further corrosion. At Dales we can powerflush a heating system in one visit. Our kit includes a powerflushing unit and a Magnacleanse filter system. A seven radiator combination boiler set up costs just £250 for a full powerflush.